When one of the earners in a household suddenly finds himself or herself out of work, it can be a devastating blow to the collective finances. However, this scenario is still much better than having no income at all, and there are ways to survive on just one paycheck in the middle of a job search or recovery from an accident. Here’s how you can strategically settle the question of how to match your new spending choices to your new budget. Don’t cut blindly. Sure, you’ll need to slash your budget if one of you loses a job, but it’s just as important to factor how much you’ll need to cut. Calculate the percentage of your household income was coming from the job that was lost, and then handle your cutting from there. Whatever you save with your new budget should match what you lost. Sort out what can go. Your mortgage is a must-have, and so is your auto (if that is the primary mode of transportation to get to and from work). However, there is still room for some concessions in your budget. For example, you can keep Internet, but cable may have to be cut. And eating out is no longer an option, but maybe you can still find enough loose change to rent a movie on Friday nights. It’s important to be both flexible and resourceful when you begin to rethink your spending to make sure you have all of the things you need while sorting out how to keep yourself motivated to save. Research what rights you have. This applies particularly to employees who have suffered an injury at work. Work accident compensation should be one of your top priorities once you find yourself well enough to plan your finances. You’ll receive government-mandated sick pay in the amount of about £85 a week for several months, but this will hardly make a dent in your budget. If your employer doesn’t offer additional compensation, it may be worth your while to secure a solicitor who can fight for more compensation on your behalf. Find new ways to make money. Losing a job has been the catalyst that many workers needed to start their own businesses. Most of the time, just trying to think of ways to make money on the side can turn into a full-time, independent job. Find a way to make money from your hobbies, and it could mean more than job security for now; it could mean financial prosperity as your new business grows. Put away the credit cards. When you’ve lost income and you already have credit payments to make, the worst thing you could possibly do is dig yourself even deeper into a credit hole. 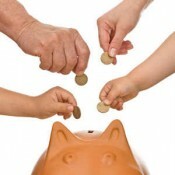 Operate on a cash-only basis until you can sort out a more permanent solution to your finances. And whatever you do, don’t stop making payments on those credit cards.